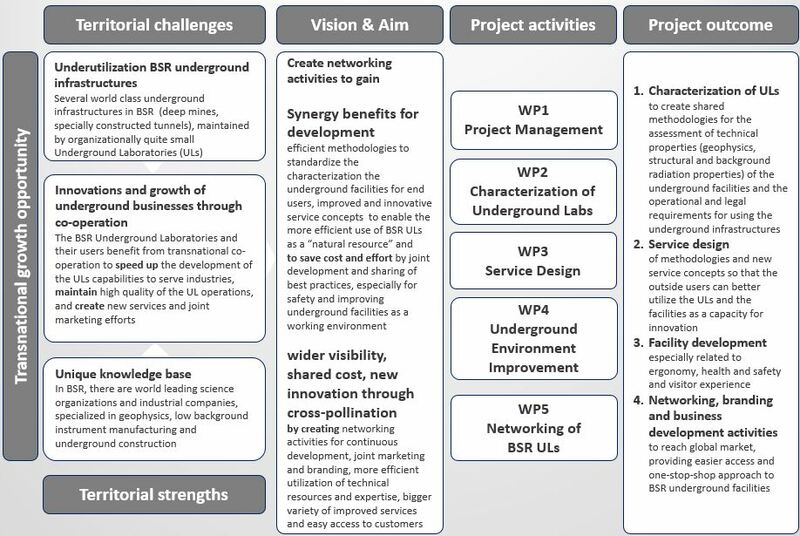 The Baltic Sea Underground Innovation Network (BSUIN) project is funded by Interreg Baltic Sea funding cooperation. Project duration is 36 months from October 2017 until September 2020. The total budget is 3.4 M€. The purpose of the project is to develop a service offering of Baltic Sea Region’s (BSR) underground laboratories (UL) in order to develop their capability to offer technology transfer utilizing the facilities and research infrastructures of the ULs for business development. Six underground laboratories are involved in the BSUIN project. Besides scientific research, the underground laboratories can provide unique environments for various businesses, such as developing technology for mining and tunnel construction equipment or radiation shielding systems or for testing of geophysical, radiation detection, and other measurement instruments. Underground Laboratories can be also sites for production, which is a new and growing field especially in the production of thermal energy or facilitating food production. There are 14 partners in the collaboration from eight countries. Take a look at the BSUIN flyer. Information about the BSUIN project in Russian.